Lexsynergy will be presenting a brief seminar on domain names covering important issues affecting IP owners. The brochure is inserted below. The seminar is presented in an informal manner during a lunch break or after hours at the attendee’s office. There is no charge for the seminar. The seminar is currently being presented in the UK, Austria, South Africa, Germany, Hungary, Czech Republic, Switzerland, Luxembourg, Slovakia and Ireland. 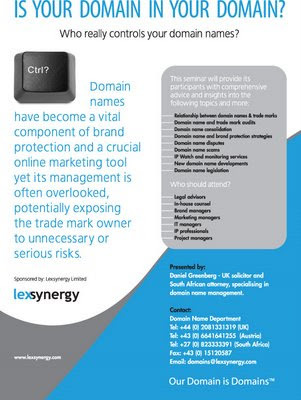 If you are interested in hosting this seminar for your employees involved with trademarks or domain names, email info@lexsynergy.com or call us on +4420 81331 319 or visit our website for more contact information.